Quiz show “Jeopardy!” is using a modified open for its Teen Tournament — but with a twist. For the tournament, “Jeopardy!,” which typically gets a new graphics package each season, took the same basic concept of the normal Season 35 open, but replaces elements with more “teen friendly” references — albeit some stereotypical ones. For example, the traditional string instrument is replaced with an electric guitar, while the comedy and tragedy masks gain cat ears and nose and gold shutter glasses, respectively. Also mixed in are a 3D football, skateboard, pair of sneakers and a drone — while some of the elements, such the molecules appear in both versions. Meanwhile, the iconic “Thinker” statue that appears in the normal open remains the centerpiece of one of the two scenes, but is now posed “dabbing” with a pair of headphones. In addition, the sample category names that surround the scene have been swapped out with a mix of teen-centric and traditional ones, while a curved, stripped background element is added behind the diamond “platforms” and shapes. 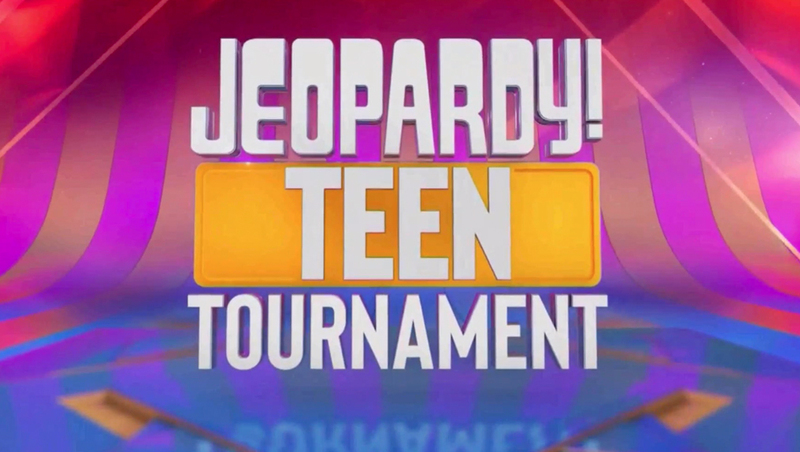 The title card retains the familiar “Jeopardy!” logotype with the word “Teen” in a gold rounded rectangle below it and the word “Tournament” below that. The open also used the “rock and roll” version of the show’s theme music — originally composed for “Rock & Roll Jeopardy!” but since repurposed regularly for the teen and college tournaments.